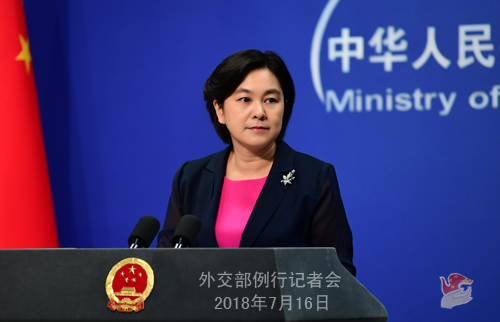 Q: In its statement on Section 301 Action, the US accused China of long engaging in unfair trade practices which have benefited itself and shortchanged the US. What is your comment? First, everyone knows that the US is the rule-maker in international trade, and the US dollar is universally accepted in international settlements, while China is a later-comer in international trade and rule-taker in the WTO. Who would believe that the rule-maker would make rules to serve others rather than itself? Second, over the past 40 years, the China-US trade volume has expanded by more than 230 times, with last year's number approximating US$ 600 billion. Such an expansion is a result of economic laws as well as the mutually beneficial nature of China-US economic and trade cooperation. No businessman is interested in loss-making deals, and capital seeks profits. How come that the US has been willingly doing loss-making deals with China over the past four decades? Why won't the US side listen to the fair words of the US enterprises who have long been business partners of Chinese enterprises? Third, China is now the largest trading partner of more than 120 countries and regions, the fastest growing major export market and the largest recipient of foreign investment among developing countries, with the FDI inflow ranking second last year. In the first half of this year, new companies registered by foreign investors showed a 96.6 percent increase year on year. Does it sound logical that all these countries have been shortchanged by China and they still want to do business like this with China? I wish to say that when it comes to trade, imbalance does not mean unfairness. Fairness is everybody making international rules together through equal-footed consultations. Fairness is anything but one party calling the shots and dictating rules-making to serve and maximize its own interests at the cost of justice and equality for others. When China negotiated its way into the WTO, no thresholds of the WTO had been lowered for China's sake. In the same vein, the global economic ocean will not be channeled back into isolated lakes and creeks just because of some individual's resistance against the tide. In today's world where our interests and futures are closely entwined, protectionism could not protect and unilateralism would achieve nothing but everyone's detriment. Q: US House Republican Kevin Brady said that in order for the trade frictions between the US and China to end, there needs to be a face-to-face meeting between the two leaders. Are there any efforts being made by China in this regard? Does China have any reply to Kevin Brady? A: Regarding the trade disputes between China and the US, the Chinese side has made its position clear on many occasions. As for how the US should deal with the relevant issues, it is time that the US government lend its ears to its people's voice, think more about its people's interests, and cherish more the order and rules of the international trade. Q: The UK-headquartered Financial Times published an article the other day about the proliferating difficulties China's Belt and Road Initiative is facing worldwide because of a lack of transparency in financing and a disregard for local conditions. What is your response? A: What you just cited has no truth in it, and China totally disagrees with it. The Belt and Road Initiative follows the golden rule of shared benefits through consultation and contribution and has borne fruits in the shape of various cooperation projects, delivering US$2.2 billion tax revenue and more than 200,000 jobs for cooperation partners. These projects have been accepted and sincerely welcomed by the relevant governments and peoples. The Port of Piraeus, under the joint operation of Chinese and Greek enterprises, has seen its container throughput traffic grow by six times and its global ranking surge from 93rd to 36th, making it the fastest growing container port globally. In Kenya, a journey from its biggest port city Mombasa to its capital Nairobi used to take over ten hours. Yet since the opening of the Mombasa-Nairobi railway line, the trip has been cut to five hours. The railway has brought convenience to the lives of the Kenyan people and added impetus to the local economic development. Tajikistan is a large cotton producer. Despite that, the country could only process 10 percent of its output. Yet thanks to a textile joint venture it set up with China, which is the largest enterprise of its kind in central Asia, Tajikistan's cotton processing rate rose to 40 percent. The joint venture sells over nine tenths of the 100 percent cotton yarn it produces to foreign markets and becomes the country's biggest source of foreign currency earnings. The list of such examples could go on and on. 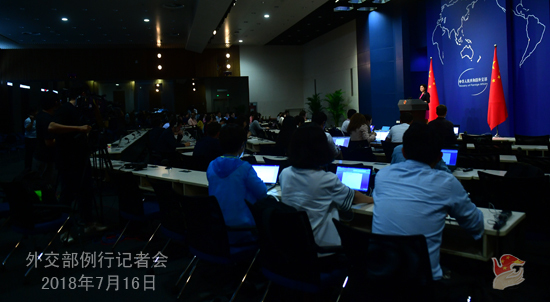 Last Saturday, Vice Foreign Minister Le Yucheng talked about Uzbekistan's story with the Belt and Road Initiative in his speech at the 7th World Peace Forum in Tsinghua University. One third of Uzbekistan's population live in the Andijan region. Travel to Tashkent, its capital, had long been a headache for the government and local people as one had to either drive four or five days across mountain passes or transit through a third country by train. This longstanding problem was resolved when Chinese construction workers came and helped build a railway tunnel in just 900 days despite the hostile natural conditions. It is the first and so far the longest rail tunnel in central Asia. Now people in Andijan can get to Tashkent in just two hours. They hailed the Belt and Road Initiative and applauded the Chinese workers for making the journey so much easier for them. While advancing the Belt and Road Initiative, China upholds the principle of equality, openness and transparency and sticks to enterprise-oriented market operations as well as market laws and well-accepted international rules. Each and every project is the outcome of equal-footed consultation. The Guiding Principles on Financing the Development of the Belt and Road co-formulated by 27 countries including China aims to build a financing environment that is transparent, friendly, non-discriminatory and predictable, highlights the economic and social sustainable development, and pursues a balance between capital mobilization and debt sustainability. 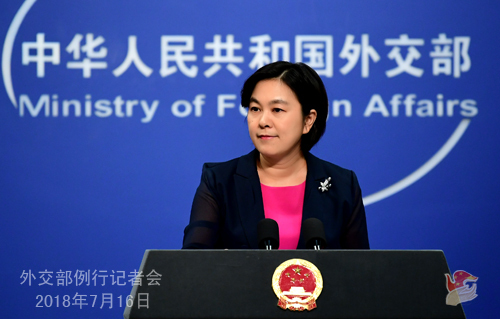 It is on the basis of these principles that China conducts its Belt and Road investment and financing cooperation, and such cooperation has helped many developing countries break financing bottlenecks. The governments and peoples of our partners have the most say in judging how their cooperation with China is faring. Facing a worldwide surge of protectionism, more visible spill-over effects of major economies' monetary policies and an increase of uncertainties and destabilizing factors, some developing countries have seen their macro-economic stability under strain. Coupled with shifts in some countries' political landscape and frequent natural disasters, several Belt and Road projects met temporary setbacks. These growing pains can only be resolved by relevant parties through extensive consultation and joint contribution. If these temporary setbacks led to the rash conclusion that the Belt and Road Initiative met headwinds worldwide and China's investment and financing cooperation is to blame, then it is typical overgeneralization, a highly irresponsible mistake that fails to reflect the reality and the overarching trend. No cooperation partner of China has been dragged into a debt crisis because of its cooperation with China, and none of the so-called debt crises reported by the media were caused by China. We hope that relevant media reports could respect the truth, take off their tinted glasses, and make more objective, unbiased and all-sided reports. Their readers deserve the true story. Q: On July 15, Chinese police officers started their first joint patrol with their Croatian counterparts in Dubrovnik, Croatia's southern tourist city. Croatia became the second country after Italy to conduct joint police patrols with China. What is your comment? A: Croatia has been the focus of attention these days, with its splendid performance at the World Cup adding to the glamour of this "pearl of the Mediterranean". At present, China-Croatia relations are enjoying a sound momentum of development and satisfying outcomes in practical cooperation. Last year, the number of Chinese tourists traveling to Croatia grew by around 60%. As the bilateral tourism cooperation enters a fast-growing phase, the first ever joint police patrol during tourist season is launched to mark a new height of bilateral police and law enforcement cooperation. The Chinese and Croatian police will jointly patrol popular places, and their presence will certainly be a plus for the tourists. China stands ready to step up across-the-board cooperation with Croatia and continue to move forward China-Croatia relations.